Civil wins Special Jury Award at deadCenter! So incredibly honored to have received the Special Jury Award at deadCenter for Civil! Especially after seeing such an incredible selection of films, it took us completely by surprise. 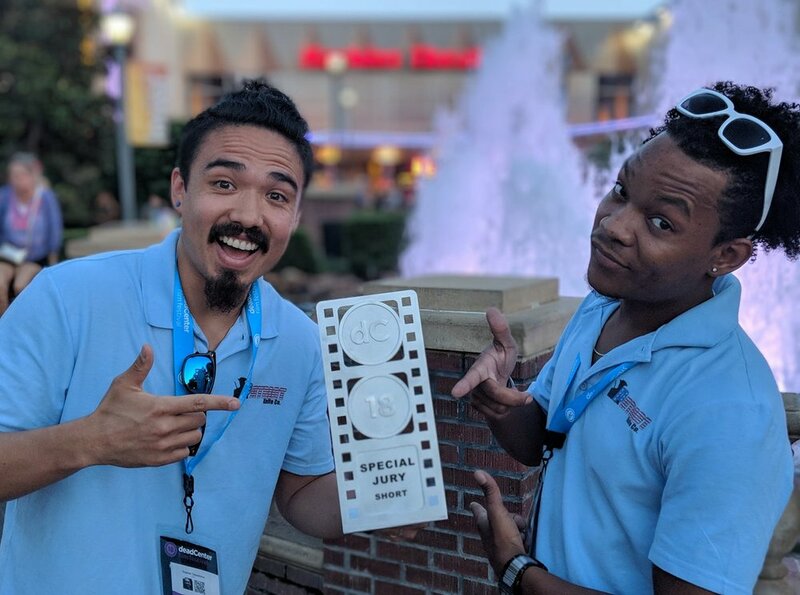 This festival was incredibly fun, with amazing opportunities to connect with other amazing filmmakers and distributors. I definitely understand how it made the Moviemaker "Top 25 Coolest Film Festivals in the World" list. Equally encouraging were the conversations I was able to have with others about the film. Hearing people engage with it, argue over it, wrestle with it... that's what I want more than anything. Breathing Through Trees premiers online via Directors Notes! Incredibly excited to finally be releasing Breathing Through Trees online! I'm grateful to say that Directors Notes has featured the film on their site/channel. If you'd like to read more about production, give the article a read! The first stop is Saber y Gracia, a small school in the mountains of Guatemala that offers education to impoverished children. We'll be shooting documentary footage and helping to create promotional material to tell their story! We just bought our one-way plane tickets for August 11th, and will probably stay there for 2-3 months. We are looking into lining additional projects up, hoping to possibly move right into other film projects for different ministries/organizations. One of my biggest problems in filmmaking is... filmmaking. I never end up doing it, and this is for multiple reasons. Aside from working a full-time job and shooting weddings on many weekends, there's always the constant flow of random crap life brings in to get done. Like Netflix. But my biggest barrier to getting things made is that I don't want to make something if it's not a project I really believe in. I end up writing and writing and writing, but never end up with a project that I feel ready to pursue. I figure that, if I have very little time for personal projects anyways, why would I waste time doing a silly project? A couple weeks ago, however, I thought about looking up the 48-hour Film Project just to see when it was coming to Chicago. By total happenstance, it was happening that weekend. I spent the whole week deliberating and asking people if they were interested, but in the end decided against it. Because of family issues, because of life, I didn't think I'd be able to have the focus that would be required for it. Plus there was almost no one willing to do it, including actors. BUT... my buddy and I decided to just shoot a silly shortfilm on our own. I literally wrote it in my head as he was packing stuff up to head over to my apartment for a movie, and ended up texting him to bring some changes of clothes. We shot that night, a little bit the next day, and then a little bit more the following day. And even though it was a silly/cliché shortfilm, it was a blast to make, and really good practice. It made me realize that I really need to just make stuff. So hopefully I'll be able to keep that perspective, and churn out some more films than I have over the past couple years. Most of them probably won't be amazing, but hopefully they'll help give me the practice I need to make a really amazing shortfilm at some point. Anyways, without further ado... here's "Crumble. A little while ago I came across a cool drawing by my friend Jack Kinyon... a character dubbed "Battleship Coat Guy". I really like the concept art, so I asked him if he wouldn't mind me trying to recreate him in 3D. I've never created a character based on 2D concept art, so I thought it would be a fun challenge. A little shy on time, so all I ended up doing was from shoulders up for now. I sculpted the head in Sculptris, then added hair, coat, lighting and background in Cinema 4D for rendering. So... I'm married! The wedding went wonderfully and we had a great honeymoon out in Montana, with lots of hiking, pictures, and fresh air. I am very pleased with how the cake topper turned out, so thought I would post the final pictures. We put three coats of white acrylic, then two or three coats of an opal nail polish. I will be fortunate enough to be getting married in just a few weeks now, and really wanted to sculpt our own cake topper. I finally set aside the time and set into it. 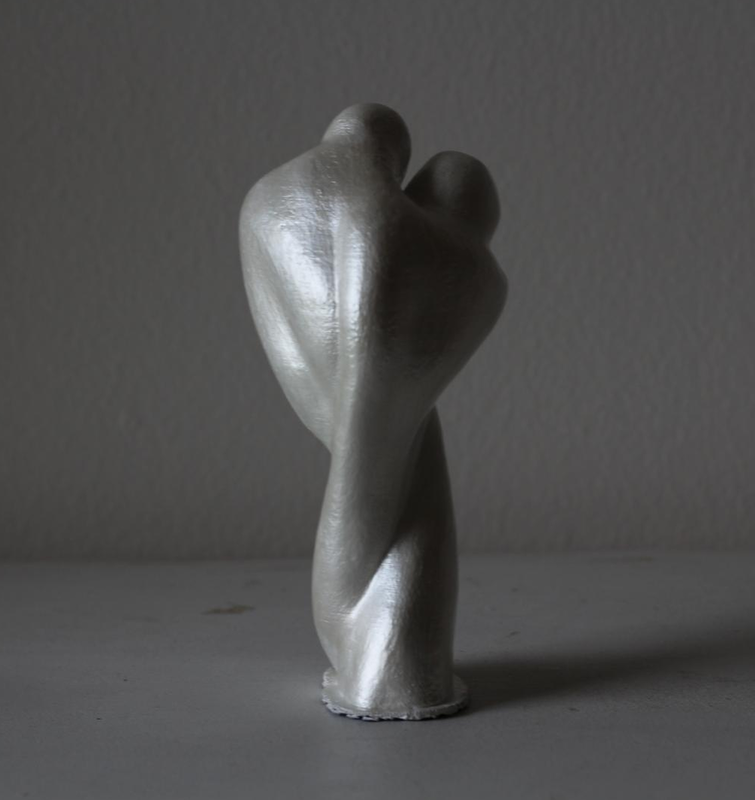 I wanted to make an abstract sculpt that reflected two people becoming one flesh. The sculpture starts as two people at the top, and winds together until it is a single base at the bottom. After sculpting it, I was able to print it using a 3D printer. I redid the head a bit, then recently decided I think I may place him in a junk-yard... kind of an odd modern-day dragon or something. To this effect, I added a rusty chain around his snout. I figure I will eventually make it wrapped around more and/or locked, then have him open his jaw and break it apart. I did pretty successfully rig his jaw, but haven't had time to get to the chain breaking part yet. The other big thing I did was create an eye with inner-lids. I still actually wanted to add a normal upper lid as well, but I think it looks pretty cool as it is anyways. I removed the background too, as I didn't have time to get a good looking junk-yard set up. I'm thinking I may model a junk heap, and have him rise out of it with pieces falling and whatnot. That may be a bit ambitious though. Over the last few months I've really enjoyed learning some new programs, including Sculptris and Cinema 4D. A few days ago I decided to practice by trying to make a dragon from scratch, as photorealistic as possible. I sculpted and textured it in Sculptris, lightly rigged and put it into a scene in Cinema 4D, then did a bit of color grading in AE. Eventually I will probably try to composite it into live action footage as well. Here's draft 1. I will try to be disciplined and continue sharing updates here, with new projects and tests. I've recently had the opportunity to shoot a music video for the talented Maddi Jane, as she performs a cover of the song "Dark Horse", by Katy Perry. If you haven't yet heard of Maddi Jane, take the lead of 1 million+ people around the world and subscribe to her Youtube channel! Watch both here and there for the video to be released very soon!